We think we have identified this correctly! We spotted it on our walk last week, in the field in front of Bell’s Castle, on Slieve Gullion. From what we’ve researched it’s not a native plant but is usually an escapee from a demesne or large garden, where it was planted for ground cover. It carpets damp places, embankments and shady roadsides, all of which makes sense in the location where we found it. Winter heliotrope or Petasites fragrans, is strongly scented of vanilla, was introduced from North Africa and has spread throughout Europe. 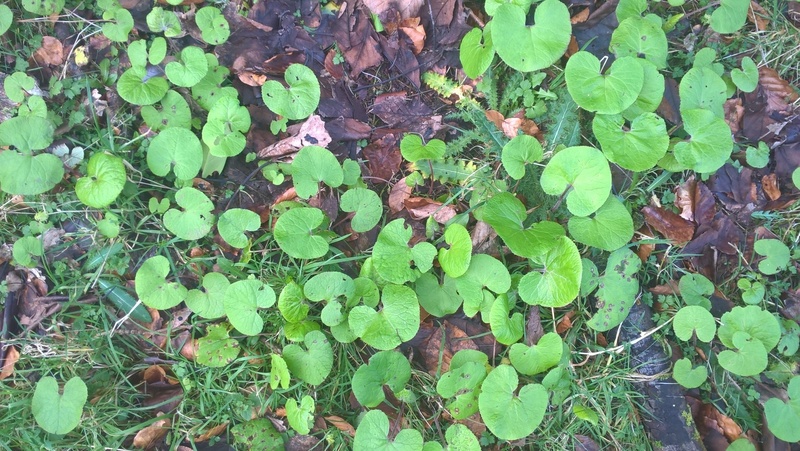 It forms large patches of heart-shaped leaves. It normally flowers from November through to March, although there were no flowers on it last week. The flowers are pale pink, in heads 10-15 mm across and are borne in spikes up to 25 cm long. Male and Female plants are carried on separate plants. From what we’ve read it seems likely that only male plants may be found in Ireland. The leaves are distinctive shiny green and kidney shaped, hairless above and hairy below. It is very invasive as it can regenerate itself from a very small part of its fleshy rhizome and belongs to the family Asteraceae.